How is this for an OTSG First! A 1978 Favorit 10-speed from Communist Era Czechoslovakia! Many thanks to Jonathan D in the Netherlands for this mean looking commuter beast. 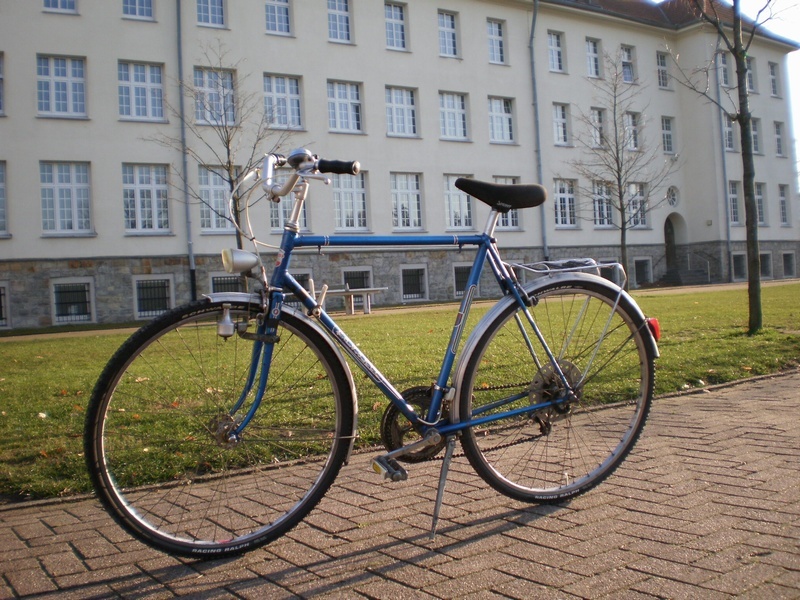 Here are some pics of my 1978 Favorit bike. It’s a brand from former Czechoslovakia (city: Rokycany). The brand doesn’t exist anymore today. Bought it for 10,- Euros on internet. 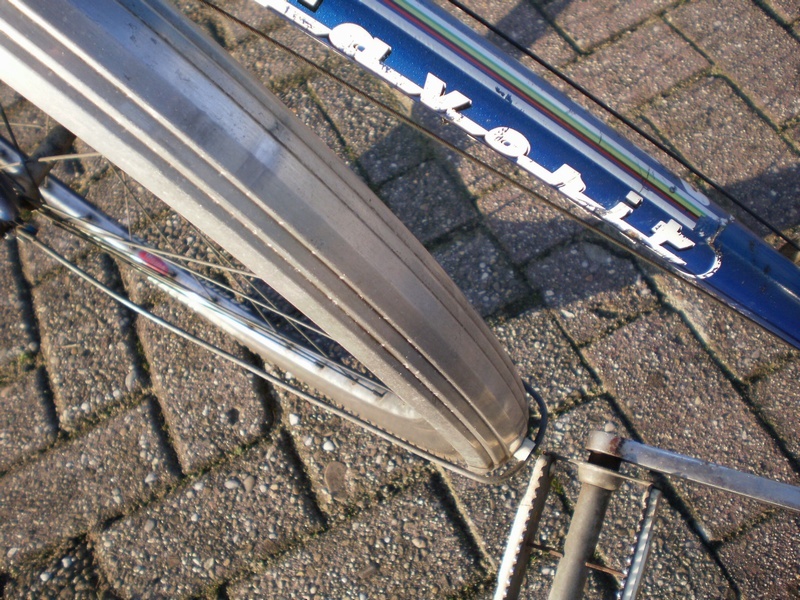 The front wheel was 27″. Now it has 28″ rear and front again. Bought it as a “winter bike” cause i don’t wanna ride my beautiful 10-speed Peugeot Supersport in the rain, or on muddy and salty roads. The 28″ Schwalbe Racing Ralph tires are perfect for slippery bad weather conditions. Originally it had worn down tires from brands “Barum” (Czech) and “Obiliceya” (Yugoslavia). The derailleur, crankset and shifters are from favorit itself. The bike is very fast, highest gear is 53×12! 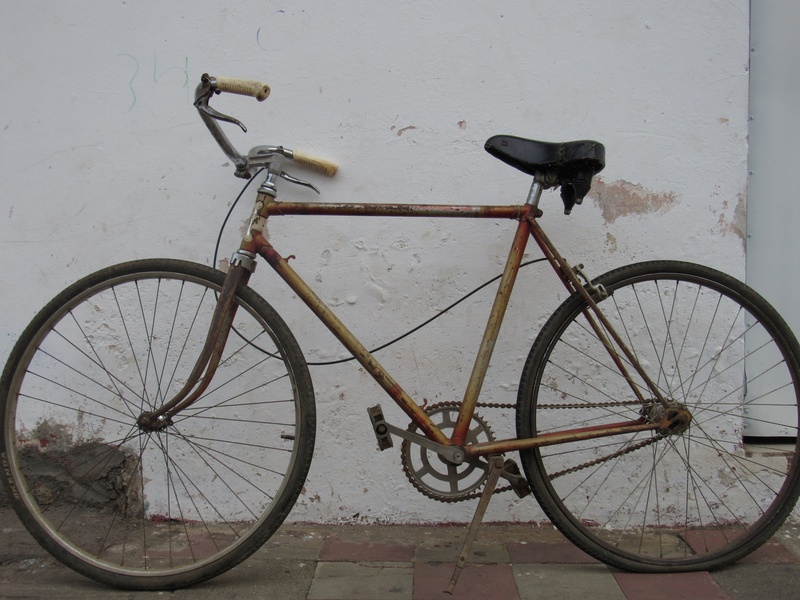 I love to overtake 50-year old suburbanites on their 1000,- euro Cannondale and Trek hybrids with my 10,- euro communistic rustbucket. The geometry is strange and funny. The pedals touch the front fender by 1 millimeter! It’s very agile because of that, and the frame is way more stiff than my Peugeot! Love your website! Keep up the great work. In Communist country, bike rides YOU! Seriously, nice bike. I have never encountered 28″ tires before. Was that standard issue in the Eastern bloc? The geometry of that frame is pretty tight too. Plus, not much rake to that fork. I believe you when you say that bike is fast. Again, NICE ride! My third favorite movie from age 12-15 right behind Fletch and Strange Brew. Very cool frame, wheels tucked in tight. And the crank,chain-ring and guard look really interesting. Nice design. First timers are getting better all the time! In tha first pic it sure looks to me like the fork is bent. Yes it has a slight bend, an easy fix. A bike shop should be able to do it fairly cheaply. I bought a used Mercier that had the pedal come very close to the front tire, turns out tyhe fork was bent slightly as was the frame. Just the forks would have been fixable. Gentlemen, I must respectfully disagree.I do not believe that fork is bent. I think that the frame (and fork) have particularly tight geometry. That is why the owner finds the bike so fast and agile. Not to belabor the point, but, 28″ wheels and tires + fenders + slight rake to fork could equal 1mm contact between fender and pedals, no? Perhaps we should all chip in, get the bike shipped to some meeting place acceptable to all and settle this most vexing and important question. Well, maybe not…….. I agree, the fork steerer tube is bent. Removeing the fork will make it clear. Core of the head tube isn’t always affected visably-tight geometry is for track and raceing bikes; this is a tourer-sould have lots of rake. Careful rideing , Pleeeeeeze! Remember this bike was produced under communist rule. I don’t think they distinguished between race, track or touring. You get ONE bike, one geometry and it should do it all! Maybe a little time in Siberia will convince you the fork is not bent! This must be the most talked about FORK on the internet. Only the fork I eat with is bent., this one must be straight as Hugh convinced me. Thanks Comrade. In photo #5 the fork leg to head tube angle appears quite off. 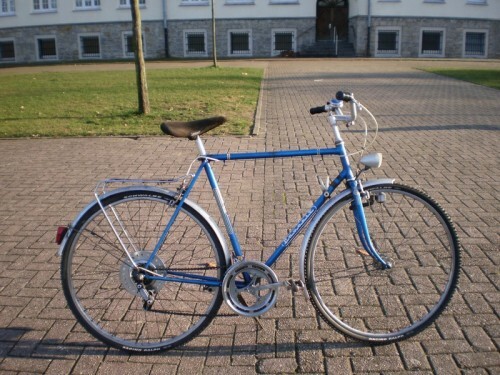 I used to have a Montgomery Wards 10 speed back in high school that featured a similar twanged fork, and we were all enthralled with its snappy handling. Truly, the fork known around the World. I had a Montgomery Ward 10 speed for about 2 days that I bought recently on ebay for less than $6 (Six bucks) but shipping was about 70. I stripped it for parts. 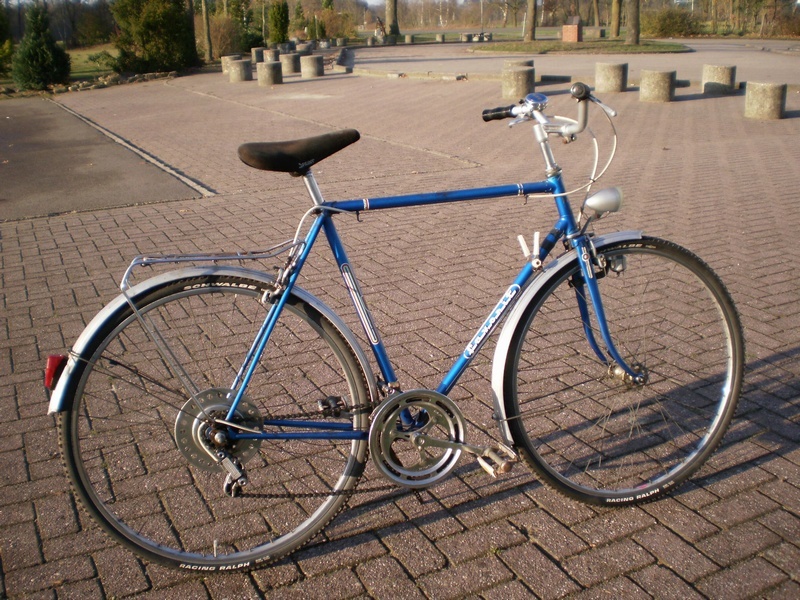 It was a 1976 or 77 and had the unusual FFS Shimani front freewheel with the freewheeling in the Crank not the rear hub as is conventional. The cassette was fixed. I tossed the frame after stripping the good parts. It was very heavy gas pipe type. The bars were good and diacompe brake levers and cool old big reflectors. I keep the fork too. Maybe some abstract sculpture someday soon. Thanks EDuard. Imagine…. a humble bicycle fork bringing people from all reaches of this mortal coil together in polite discussion. There is, dare I say it, hope. Ah, the power of the old ten speed. Anyway, does anybody know if those old front freewheel bottom brackets will accept a one piece to European style bottom bracket adapter? Heavy as gas pipe perhaps, yet some were pretty nice frames. Well i never expected all this debate over the fork in my rusty old OTS. Of course, i got curious because of the discussion. I checked the bike out very closely. Let me help you out, and finish some of the doubts. One thing i’m sure of, is that the fork crown and steerer tube are not bent. It is in exact line with the underside of the headset and frame tube. Steering is smooth as can be. The steerer tube is perfectly straight. What is the case here, is that the fork leg have moved a little inside the fork crown. The fork legs stick into the fork crown only 7 milimetres! The angle between fork crown and fork legs is different. It should be the same. I mean the straight upper part of the fork legs, were they “enter” the fork crown. It could also be that the fork legs themselves have been bent a little, but i doubt it. 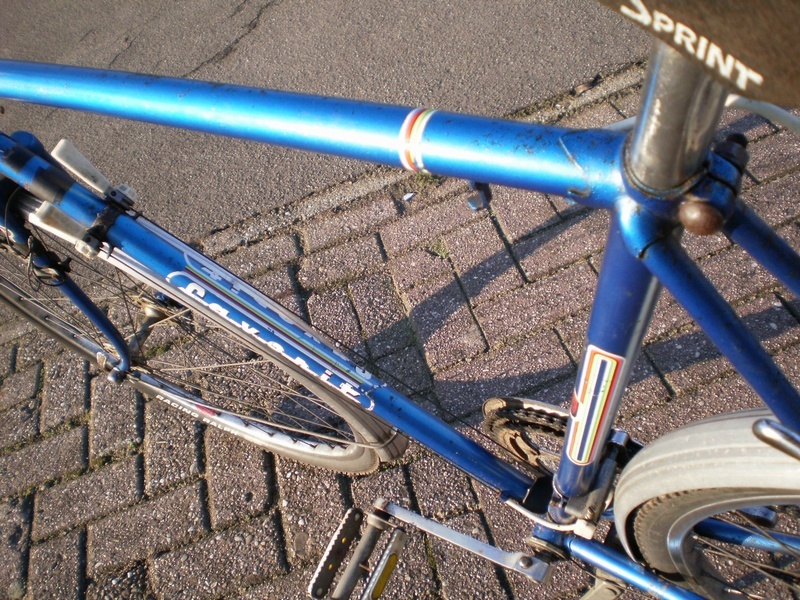 They have the same bend as my Peugeot forklegs, and those of my old Prisma 1-speed. check out the website. On the third pic, you can see how little the forklegs stick into the fork crown. Conclusion, forks are not bent, steerer tube not bent, but still, it isn’t the way it should be. So, most of you were right after all. By the way, the front fender doesn’t touch the pedals. There is about 2 milimetres space between them! Do you know where can I buy a bike like yours? Just to add to the fork thing, I have a Fovarit with the same Fork “problem”.The bike itself needs some fixing overall so I didn’t ride it yet. But reading this forum makes me think that it’s actually meant to be like this. You have rare version of stickers on your Favorit. Only same export versions have it. I see this first. do you know how old is?